Hang on, Captain Thunder? Yep. Originally the character was called that, but again Fawcett were pipped at the post. Fiction House produced a Captain Thunder (Captain Terry Thunder of the British Army) in Jungle Comics #1, just ahead of Fawcett. Again, a name change was in order. 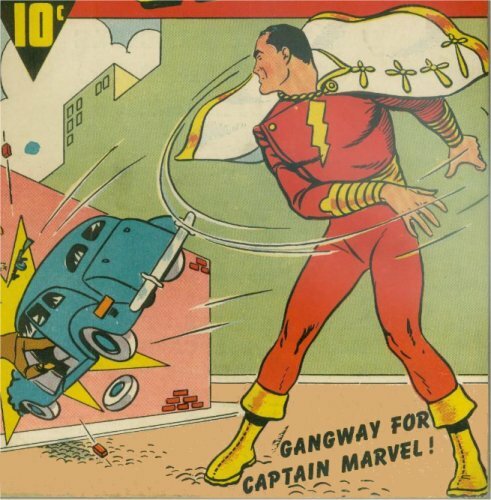 Thus Captain Marvel was born. Comments: DC Comics had acquired the Fawcett characters when that company went bust. 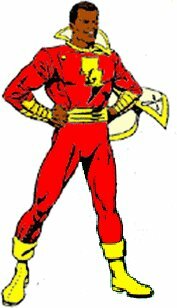 In the 1970's Roy Thomas proposed relaunching Captain Marvel in the DC Universe, but since Marvel Comics now had a character of that name (Mar-Vell of the Kree) he suggested renaming the character Captain Thunder, and in a move towards equalisation, making both Billy Batson and Captain Thunder black. 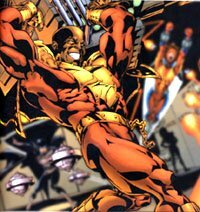 This version of the character never got past the drawing board, although he was mentioned in a comics journal, complete with illustrations by Jerry Ordway. Roy would go on to use the Captain Thunder name for another, very different character a decade or so later. Powers/Abilities: Superhuman strength and invulnerability, able to fly, superfast, etc. Basically the same as Captain Marvel. 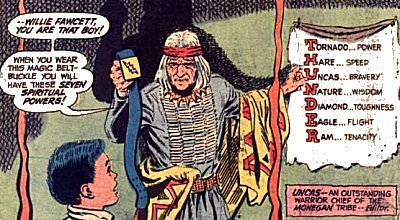 History: Young Willie Fawcett is given a magic belt buckle by Merokee, the last medicine man of the Mohegan tribe, which when activated will transform him into the heroic Captain Thunder. The belt is activated when he says thunder, which calls on the spiritual powers of Tornado (for power), Hare (for speed), Uncas (for bravery - a text box informs us that Uncas was an outstanding warrior chief of the Monegan tribe), Nature (for wisdom), Diamond (for toughness), Eagle (for flight), and Ram (for tenacity). Captain Thunder would go on to battle Superman. Comments: DC did decide to use part of Roy's idea, creating Captain Thunder, a hero from an alternate Earth. Other than being black, Roy's original proposal for Captain Thunder was actually closer in terms of secret identity and costume to his source than this one was. Powers/Abilities: Same as the original Captain Marvel. 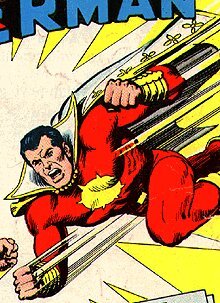 History: Apparently the successor to Billy Batson's magical powers, this Captain Marvel was a member of the Justice Society in a world where BatGirl and Bruce Wayne ran Gotham City as a fascistic state with no superpowered beings allowed to enter it's borders. Shazam (1974), where Cap was played by Jackson Bostwick in the first season and John Davey in the second and third. Michael Gray was Billy. This show aired alongside Isis. Legends of the Superheroes (1979), a dire two part TV movie, where Garrett Craig played him alongside several D.C. superheroes. The Kids Superpower Hour (1981), where Captain Marvel's cartoon shared air time with Hero High (and the even had a crossover). Burr Middleton did the voice chores for both Cap and Billy.